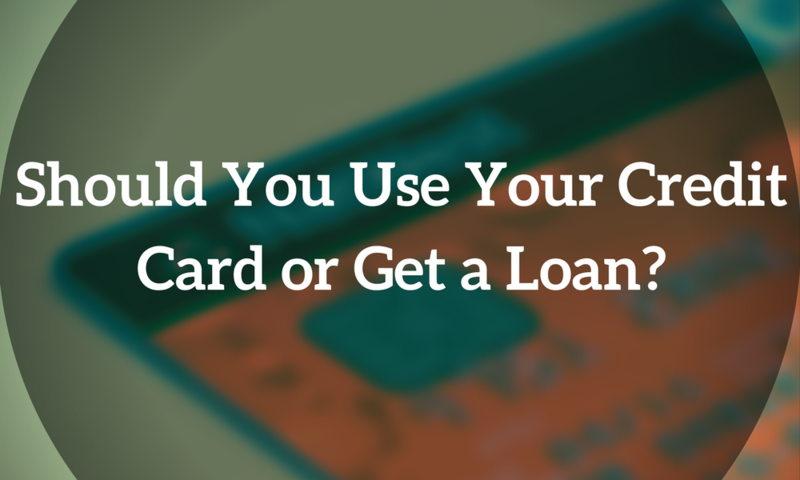 Should You Use Your Credit Card or Get a Loan? There comes a time when you need to make a purchase that you know is going to take some time to pay off. When that time comes, should you use your credit card or get a loan? Credit cards are the better choice when making smaller purchases or consolidating smaller debts. Use them for purchases adding up to no more than a few thousand dollars that you feel you can easily repay within a year. If you use a credit card with a low introductory rate on new purchases, you could end up paying very little interest on purchases for several months. Of course, you will need good credit to qualify for a credit card like this. Many credit cards offer rewards just for buying things you normally buy like groceries, dining, gas and retail. Cards like these can really help your savings if you make your payments on time. Just don’t forget to pay off your balance on time so you don’t lose your rewards to high interest or fall into debt. Putting a big expense on a low-interest rate credit card might save you more money at the time, but it could hurt your credit score in the long run by increasing your credit utilization. Remember to try to use ideally around 10%, but no more than 30% of your credit line. Credit card rates are variable, so the amount you are charged for keeling a balance on your card may change over time. If you have trouble keeping up with your monthly payments, this could mean serious trouble for your budget, and your credit score. Personal loans are the better option for larger purchases that will take you more than a year to repay. Also consider a loan if you feel you might be tempted to spend too much with a credit card’s open credit limit. If you need to borrow an amount that is higher than your credit limit and that you know you will need more than 15 months to pay off, a personal loan is a better option. Once you qualify for a personal loan, you get to choose a loan term and monthly payment amount that fits your budget. If you decide on a loan with no prepayment penalties, you can even pay ahead, if you’d like. Many credit scoring models don’t view personal loans the same way as credit card accounts. If your personal loan is listed as an installment loan as opposed to revolving credit, it won’t be counted in your credit utilization ratio. Applying for a personal loan counts as an inquiry into your credit. This will only lower your credit score by a few points, though. Avoid applying for several loans at the same time. Check your credit scores before you apply and try to pick a lender with credit requirements you will likely meet. You can ask potential lenders for the minimum credit score they require instead of putting in an application for a loan. If you take out an unsecured loan, you could be hit with a high interest rate. Lenders do this to offset the risk of lending you money. If your budget is struggling, an unsecured loan is probably not the best option for you. Do you need to make a purchase and are wondering should you use your credit card or get a loan? Give us a call at 1-866-991-4885. 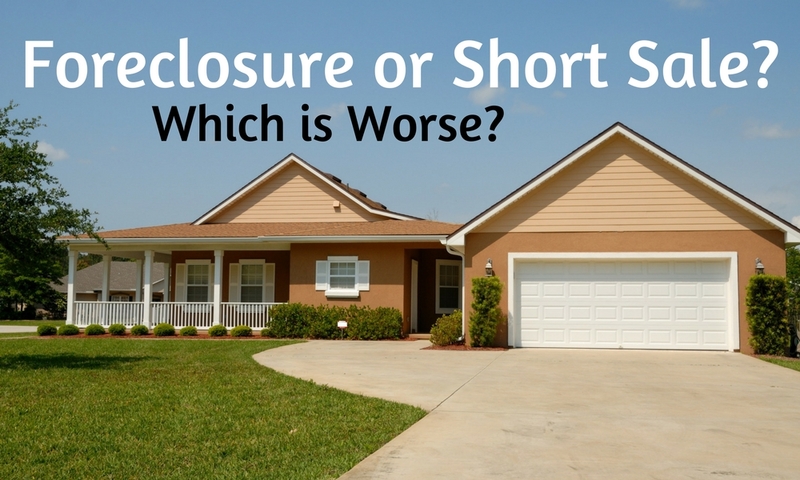 Foreclosure or Short Sale? Which is Worse? Losing your house for whatever reason is not an easy event to go through in life. It gets even harder not knowing if your fate will end with a foreclosure or short sale. What happens after that? Your credit score will take a hit, you know that. Here is what to expect in both situations. In terms of the impact on your credit score, they’re about the same. A foreclosure or a short sale will hit your score about 100 to 150 points. If you are able to negotiate a short sale without ever being late on your mortgage – which is extremely rare – it’s only about 10 to 20 points off your score. Although that hardly has an impact, it shows that the late payments are what will kill you. Another aspect to consider between foreclosure and short sale is the waiting period for when they come off your credit report, which is a different consideration than your credit score. This all depends on the loan you’re getting. For an FHA loan, there’s no difference between the two: they’re both 3 years. Both stay on your report for seven years from the date the first delinquency is reported. Not the date of the foreclosure, but the date of the first delinquency. One more thing to consider is deficiency balance. A deficiency balance is the difference between what you owed on the loan and what you got from the sale of the house. That deficiency balance is something you want to consider. Typically, in a short sale, part of the negotiation is that the deficiency balance is forgiven, or the short sale is a new agreement that your realtor negotiates. In most of the short sales, everybody gets that. Foreclosures are a different story (depending on the state you’re in). In many states, the bank can go after you for the deficiency between what they get at the auction and what you owed on your mortgage. However, there are many states out there, like Arizona for example, that are anti-deficiency states, meaning they can’t go after you for that. In fact, they can’t even report that deficiency balance on your credit report. An anti-deficiency balance means the bank chose to foreclose and therefore waived the right to sue you for the deficiency balance. Do you have any questions regarding foreclosure or short sale? Let us know. To enlist the help of a trustworthy, effective credit repair company, call us today at 1-866-991-4885! 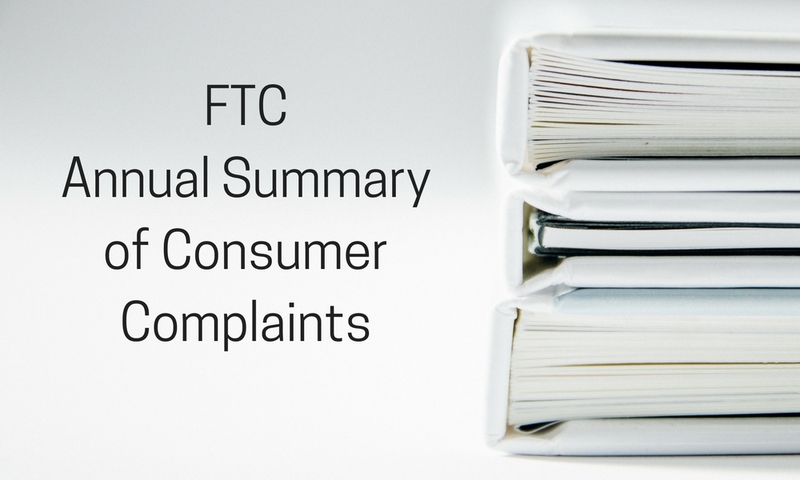 Every year, the Federal Trade Commission releases their annual summary of consumer complaints. This is a report on the categories that received the highest number of complaints from consumers. 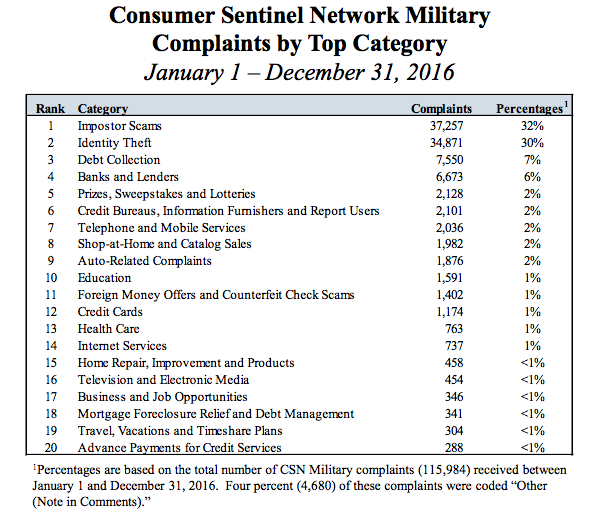 For 2016, 3.1 million complaints were reported first to the Consumer Sentinel Network before the FTC sorted them into 30 separate categories. 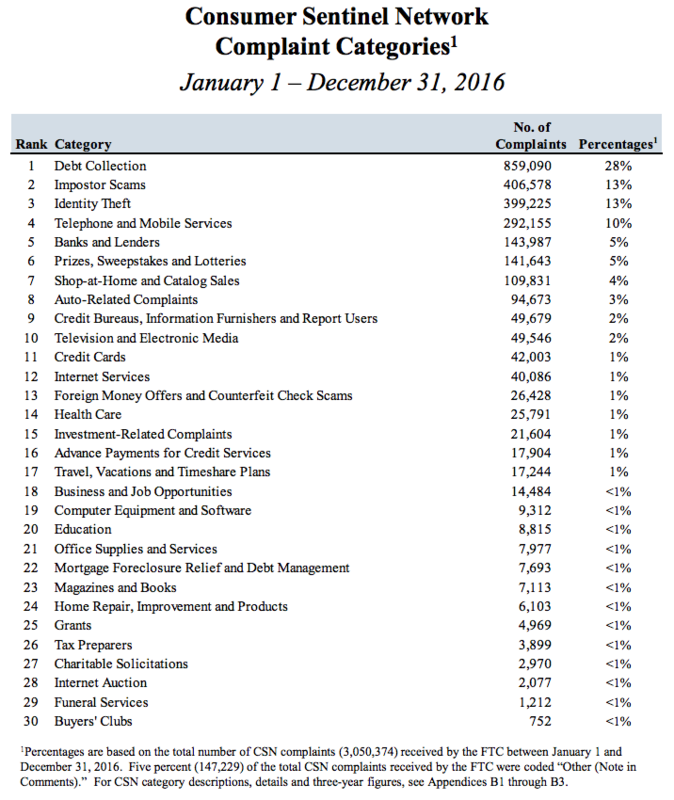 The number one complaint in 2016 from consumers was debt collection. It received 859,090 total complaints throughout the year, which was 28% of all complaints. Impostor scams passed up identity theft for the first time as the second most common category of consumer complaints. Reaching a total of 406,578 complaints, it made up 13% of complaints. Identity theft also made up 13% of complaints, but instead had 399, 225 complaints. The rise in impostor scams is said to be due to an increase in reports of government impostors. While impostor scams come in many forms, they all work the same way. A scammer pretends to be somebody trustworthy to get the consumer to send money. Impostor scams topped the list of military consumer complaints, which was followed by identity theft complaints. Twenty-nine percent of the consumers who complained of identity theft reported it as being used to commit tax fraud, while more than 32% of consumers reported it as being used for credit card fraud. The most common method of payment for those who lost money to fraud was by wire transfer. Fifty-eight percent of people lost money this way. Of those people, 77% said they were first contacted by phone. The FTC says to “be wary of any caller asking for a wire transfer.” Government agencies will never ask anyone to wire money and it’s illegal for telemarketers to ask you to pay by wire. If you do receive a call from a government agency, call them back on a number that you do know belongs to them. Do not call the number someone left you on a voicemail or gave you over the phone. Is there more you would like to know about the FTC’s Annual Summary of Consumer Complaints? Let us know! To enlist the help of a trustworthy, effective credit repair company, call us today at 1-866-991-4885! Pesky student loan debt has its way of sticking around for what feels like forever. With interest adding even more to what you have due each month, it can sometimes feel a bit overwhelming. Fortunately, there are ways to take on your debt that can hopefully lead to less stress for you. So take a step back, breathe, and check out our tips for tackling student loan debt. This is the best time to start putting away some money for your future payments. The grace period is the time before you actually have to start making payments. Because nothing is leaving your bank account, you should consider putting some away into a savings account. Depending on the loan, you may not owe payments for six months for a Federal Stafford Loan or for nine months for a Federal Perkins Loan. That’s plenty of time to get some cash banked up before you start making payments. Be aware, though, interest on subsidized Stafford Loans begin accruing during the grace period. Make sure you check with your loan servicer if you have a private loan, because their terms may vary. Standard repayment for federal student loans typically calls for fixed monthly payments over a certain number of years depending on what your loan amount is. If you can make the shortest amount of time work, that means less interest than if the debt is paid over a longer period of time. Keep in mind that you can change your plan once a year. If your current repayment plan isn’t working out, call your loan provider to see what other options you qualify for. The federal government offers repayment plans that limit the size of monthly payments based on your income. The Income-Based Repayment Plan limits payments to 15% of discretionary income, which is defined as the amount your adjusted gross income exceeds 150% of the federal poverty level. Then, after 25 years, you’re done paying even if you still have a balance. The Pay As You Earn Plan limits your loan payments to 10% of your discretionary income. Then, after paying for 20 years, you’re done. Payments through this plan can be one-third lower than the Income-Based Repayment Plan and are forgiven 5 years sooner. To qualify, however, you must have at least one loan from after October 2011 and none before October 2007. If you don’t qualify for the first two, the Income Contingent Repayment Plan could be an option. Terms for this plan aren’t as generous and discretionary income is defined as the amount your adjusted gross income exceeds 100% of the federal poverty line. Your payment will be 20% of that discretionary income and any remaining debt won’t be forgiven until you’ve made 25 years of payments. Make good decisions about your payments. It could lead to you paying off your loans more quickly and save you thousands of dollars. Sign up for automatic payments so you’ll be less likely to make late payments and have to pay late fees. Many lenders offer slight interest rate deductions for this. Forbearance is easier to get and allows you to put off or reduce payments for three years or more. Deferment allows you to stop making payments for a certain period of time in specific situations. Examples of these situations can include, but are not limited to, returning to school, unemployment, or having a baby. However, you are still expected to pay interest on these methods, either during or after the period you are using them. The only time you won’t have to pay interest is if you use a deferment on a subsidized federal loan. Only use one of these options if you find yourself in a tight spot. Don’t use either for too long because interest does continue to accrue during the period you are using them. This isn’t to say consolidating is absolutely a bad thing, because it can have its benefits. For instance, if you want income-based repayment options and your lender doesn’t offer them, you might want to take that loan somewhere else to get that option. You may also consolidate to remove a co-signer from a private loan or are juggling too many loans. That being said, keeping loans separate can have its benefits, as well. With separate loans, you can potentially accelerate your repayment by paying down several small loans rather than one large one. 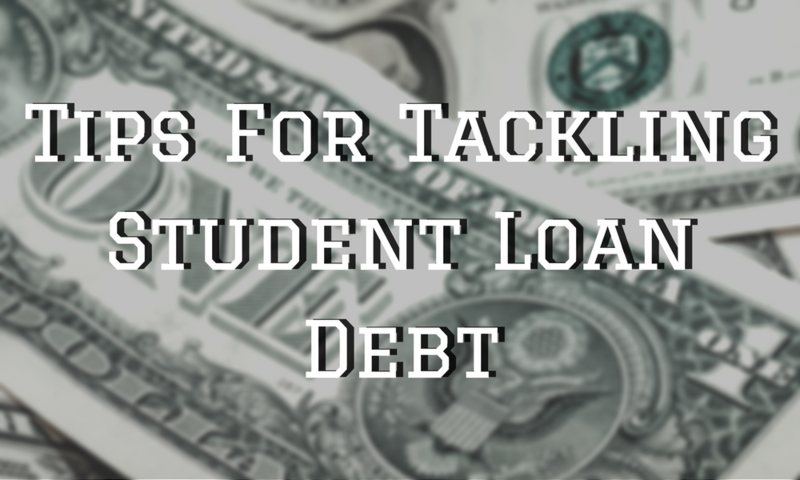 Do you have any questions regarding these tips for tackling student loan debt? Let us know! To enlist the help of trustworthy, effective credit repair experts, call us today at 1-866-991-4885!